Kia reveals Cadenza, a new front-drive luxury model at the Detroit Auto Show. Lincoln Motor Company has yet another reason to worry. The all-new 2014 Kia Cadenza was launched at the North American International Auto Show this week. Kia is continuing its march from bare bones economy vehicles to luxury cars with world class styling and performance. Kia is not marching alone. Rather, it is lock step with sibling Hyundai, who presently markets this same car, but with its own flair, as the Hyundai Azera. Kia is wise to bring this new, upscale, premium sedan to market. Here’s why. The new 2014 Kia Cadenza gives Kia’s existing customers a place to go up from the Optima. The Kia Optima has been a wild success for Kia. The company’s style guru has turned an ugly duckling into a swan. Kia is one of the few non German companies in the US market that can truthfully claim that their car has “European-Inspired Styling.” Indeed, the company’s leader, Peter Schreyer is from Bavaria and he still maintains a design studio there. The company’s engineering staff has transformed the platforms, drivetrains, and infotainment systems from entry level (barely) to class leading in all regards. The Optima is a very competitive car in the mid-full size class competing well with Accord and the like. In fact, both Kia and Hyundai’s only problems with the sedans it makes is that it can’t keep up with demand. Kia also had another problem that this car solves and that is that as buyers age and become a little more affluent, many like to step up to a slightly bigger, more power, and more luxurious car. Kia had no place for those buyers to go – until now. 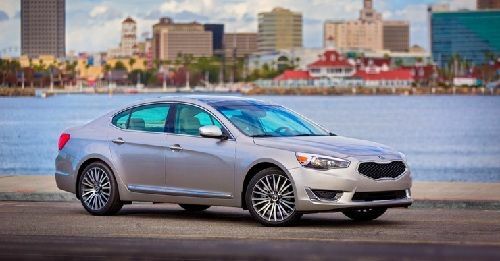 The new 2014 Kia Cadenza will be slightly longer than the current Optima, which is not a small car for the class by any means. It will also be more powerful. Although we all like to tell ourselves that 4-cylinder turbocharged engines are all than a bag of chips, they really can’t match the power, refinement, and even fuel efficiency that a modern V6 has. Now, those customers can step out of an Optima, and into a Cadenza. Kia retains a customer, and an affluent one at that. In its press release Kia outlined the engine testing it did on the Cadenza saying “During durability testing, the engine is run 300 continuous hours at redline under full load then for an additional 20 hours at 10 percent above redline under full load.” Customers will be glad to hear that, but with a 10 year powertrain warranty, it is no surprise Kia wants to do all it can to make sure the engine is durable. Kia calls the Cadenza is most technically advanced vehicle ever. Customers will see this in the myriad infotainment and safety features Kia packs it with. Kia’s UVO infotainment package now with Google Maps will be the basis for the man-machine interface. The high resolution, 8 inch touch screen will appear large to customers moving up from the mid-full size class. Sound will come from a .55 kilowatt surround sound system complete with subwoofer and 12 speakers. Premium features like a panoramic sunroof, adaptive front headlights (that will move as the car turns), Nappa leather and a power rear sunshade will be available. Seats will be 12-way adjustable, include a thigh extension, and are ventilated. Advanced Smart Cruise Control, that can keep you safely following the car ahead is part of the technology package. Interestingly, Kia has added a hydrophobic front windshield that will shed water. That will save drivers time and money and help them end their Rain-X addiction if so afflicted. Prices have not yet been announced, but using the Hyundai on-line configurator it is hard to create your own Azera that breaks $38K. Kia will likely keep this car under $40k. At that price, this vehicle is a very good value. Particularly considering the warranty is so much more comprehensive than Toyota offers. The 2014 Kia Cadenza will be on sale in dealer showrooms starting late spring.